Another card for the Hope You Can Cling To Challenge, this time our host, Taylor has asked us to use two different types of every thing we use on our card e.g. two different colored buttons/two different designer papers… Try and wrap your brain around that one when you use the design principle of threes or other odd numbers! LOL! I’ve used the Deconstructed Sketch #73 by Sheri Gilson. My large background piece of designer paper has been dry embossed. It’s followed by a hand cut banner of corrugated cardboard. Topping that is a piece of red card stock that has been cut with a pennant die. A piece of coordinating designer paper is on top of that. Next comes a piece of solid color card stock that’s also been dry embossed. Followed by another hand cut pennant that the sentiment is on. Next, two poinsettias stamped with the same stamp…remember I can only use two stamps right? But I made them different by using different designer papers and different colors of Stickles for some bling. And the embellie…two buttons…different colors and sizes with two different colors of twine. Whew!!! I think that’s all! This really was a challenge but definitely a lot of fun! Have you considered doing the Hope You Can Cling To Challenges? Feel free to click on the blinkie at the top of the right hand column and join in! It’s for a very worthwhile cause! Great texture and papers and use of the sketch! A wonderful Christmas card. so many great patterns together. Great card. Oooh! This is wonderful! 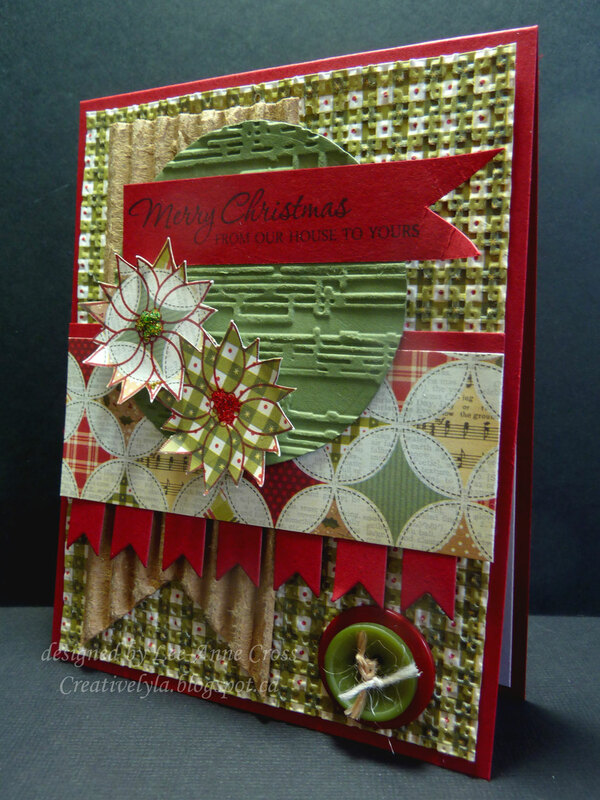 I love your gorgeous use of texture and fabulous papers! Thanks so much for joining us at the Deconstructed Sketch!